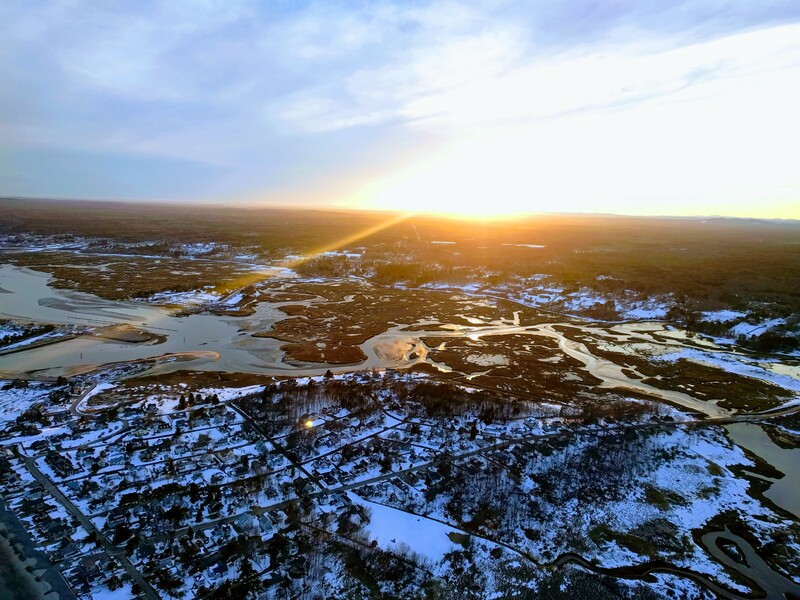 After a couple of good forecasts that turned out to be way off-base, on Tuesday I flew an evening between Nor’Easters. March flying can be wild, but it wasn’t weather phenomena that made my flight interesting– I had an equipment malfunction on my face. More on that later. This has been a stormy March. We’ve had 4 Nor’Easters, and March is barely half-done. Nor’Easters– so named because the counter-clockwise system of low-pressure generating them is usually out at sea, creating a North-East gale– Are strong enough to stop the lower tropospheric effects of the North-West airflow entrained by the winter Polar Vortex. As such, they tend to create an eddy in the air currents. Just before the storms hits, air can briefly calm down before it switch direction and blows mercilessly. Sometimes it lasts just a few hours. Last Tuesday, The wind gently transitioned from a strong South flow to a weak North flow. The earth was wet and snowy, and the tide was going out in the afternoon. The temperature was 39ºF. The allure of the beaches combined with an unusual and significant South wind (our beaches face south) brought me to a beach in Kennebunk. I arrived ready to fly, able to take to the skies in less than 5 minutes if need be (I setup and fly out quickly to avoid attention). Upon arrival at 4:30pm, the wind was still blowing strongly onshore from the Southwest; perhaps 18-20 mph. The gulls were having trouble penetrating. I left my gear in the car and walked around the beach, checking out the ancient tree stumps that had been uncovered from the beach erosion. There was a lot of storm damage evident. Somewhere out there on the beaches are a couple of Revolutionary War-era shipwrecks, and a March 2018-era tugboat wreck. My mission for the day: search for fuel barrels from the sunken tugboat that had possibly detached and floated to shore, or up a river. In the past I’ve found parts from shipwrecks aground far up the tidal zones. The wind hadn’t subsided in half an hour, so I got back in the car and drove to the other nearby beaches, hoping that if I didn’t get to fly, at least I’d get to see the ancient shipwreck on Mother’s Beach. Tide wasn’t at its lowest, though, so the wreck hadn’t surfaced. I hung out with the friendly young seagulls, who seemed as anxious as myself about the wind. Around 5:30 the wind seemed to be getting reasonably (10-12mph), so I figured I’d make something of the day and kite my wing. 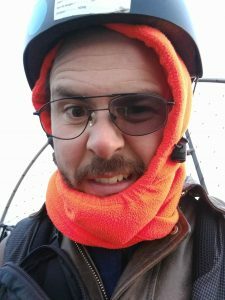 I broke out my kiting harness and Dudek Hadron and did some jump-flights, running, then flaring and jumping at the same time. A couple of dog walkers stopped to watch. Around 6pm I realized that the wind was totally fine for a reverse-launch in this laminar wind. I laid out the wing on the sand in a rosette so that it wouldn’t blow away, then put the harness back in the car. I untied my Air Conception Nitro 200 from the car’s hitch carrier and gave it a quick check to make sure everything was how I left it when I put it on the car. I verified the strobe light was operational. I checked the flotation for friction holes. I connected the battery to the electric-starter, but I left the master switch OFF. I disconnect the battery when transporting the motor for two reasons: it’s really easy to accidentally hit the master switch the way I tie up my motor, and people are touchy when they see a shiny piece of technology within arm’s reach of the pavement. I put my phone in my chest holster, checked for my hook knife, and got my earplugs ready. So that my nose wouldn’t freeze, I put a sun-blocking nose-protector on my glasses, hoping that it would block the wind, too. It was an experiment. This turned out to be the variable that changed my plans mid-flight on Tuesday. I brought my motor down to the beach, flipped the master switch and fastened the motor to my back, taking care not to bump the electric-start button. After checking that nobody (or dog) was near me, I did a brief but thorough warm-up; I had previously warmed the motor at home, though it had cooled by 6pm. I hooked up to the wing for a reverse inflation, but there was a frustrating problem– the wind had calmed down to maybe 4-5 mph in the space of the 5 minutes I took to get setup. A few fluffing attempts to get the wing from a ball-shape to a wall-shape and I was ready to go. Launch was uneventful, except for a slack speed-bar line that had snagged over the weight-shift bars (TODO: tighten speed system). I flew Southwest down the beach, marveling at the storm damage in the multi-million-dollar properties abutting the shore. Crossing 1200 feet over into Wells Beach for some photos, I found that the nose-protector was catching the wind and blocking some of my view when it flipped up periodically. My hands still in their winter gloves to prevent finger grease on my lenses, I took my glasses off my face so I could remove the nose protector. I undid the velcro on the protector with my frozen, unfeeling hands and noticed a piece pop off and fly away. I didn’t think much of it immediately, and put my glasses back on. The right lens was REALLY smudged up. My gloves must have been dirty. I reached up to wipe my lens clean, and poked myself in the eye. There was no lens. In my numbness, I had popped out a lens while removing the nose protector. My vision is really bad, so I found it easier to shut the watering right eye and search for the piece that flew away, knowing now that it was my lens and hoping that it had landed in my seat. I got lucky! I found it in a fold in my jacket. Rather than risk losing it again, I stuffed it in my chest holster. I abandoned my wreck-spotting mission and turned home. Landing with one eye was intimidating, but it turned out to be a very smooth landing. I was probably hyper-focused on executing a perfect landing. The lack of depth perception inspired me to use my left foot as a “sensor” for when I touched the ground. When I felt the foot touch, I started a gentle speed-bleeding flare, which transitioned from a skiing-slide to a slow jog. I think I could get used to flying and landing with one eye– as long as I was landing in large, flat LZs in laminar wind. 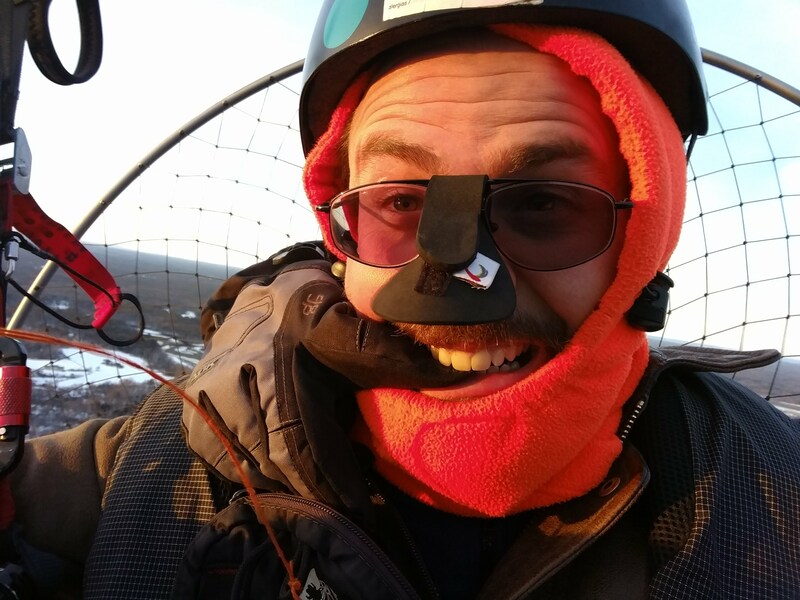 I took a selfie of my dumb face and popped the lens back in for a sunset flight in the now almost nil wind. Cant wait for when its my turn. Looking forward to training in a few months. © 2019 - School of Personal Flight. All rights reserved.WARNING: Powered Paragliding involves spinning propellers, weight on your back, and heights. As such, Powered Paragliding is an inherently dangerous sport. Those who practice Powered Paragliding do so at their own risk.